The layout for this stunning Double Wedding Ring came from the book, "Double Wedding Ring Quilts: Coming Full Circle" by Susan Stein (ISBN 1-57432-771-2), specifically the "River of Gold" layout. 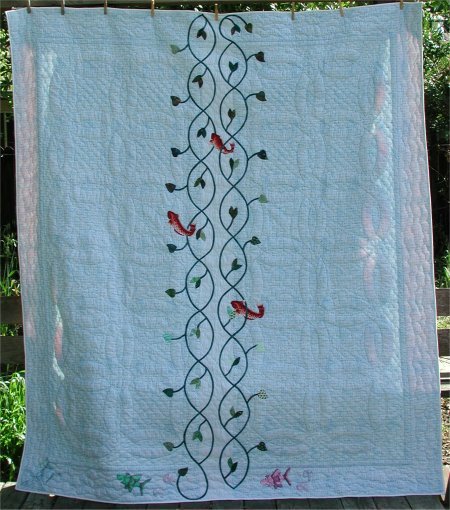 This book demonstrates so beautifully an incredible array of radically different layouts for Double Wedding Ring quilts. This particular layout is spectacular in its simplicity: imagine that the double wedding rings are superimposed on a graphic background so that it appears as though you can see through the double wedding rings to the scene behind it. In the book, the "River of Gold" quilt's background is a landscape scene that peeks through the double wedding rings. I found a Michael Miller koi line of fabrics and the companion prints that went with it. 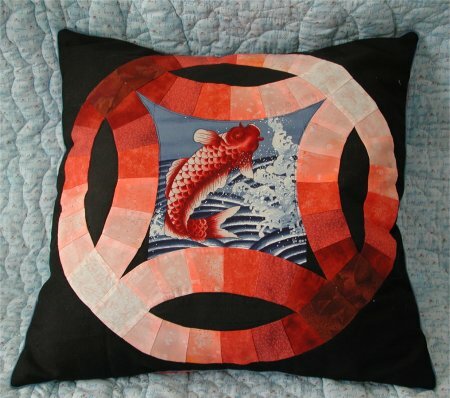 This quilt has the black depths of the ocean at the bottom of the quilt, the koi jumping though the waves in the middle and the blue sky at the top. The rings themselves are shaded from light to dark coral. The two outer borders are done in the companion prints and are separated by a narrow accent flap. It was about 3 months before Catherine was to graduate from high school that I realized, with horror, that her Dad & I hadn't really thought about what kind of graduation present we should give her. I knew I needed to give her a very special quilt, but in delaying so long, I knew that I would have to work on it when she was at home rather than working on it only when she was at school. 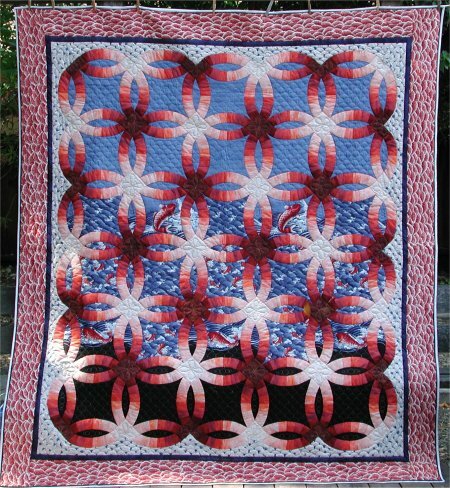 As the quilt progressed on my design wall, she admired it and commented on how she really liked the koi print and how well the shades of coral for the rings coordinated so nicely with the rest of the quilt. I smirked behind her back. This is a queen sized quilt. 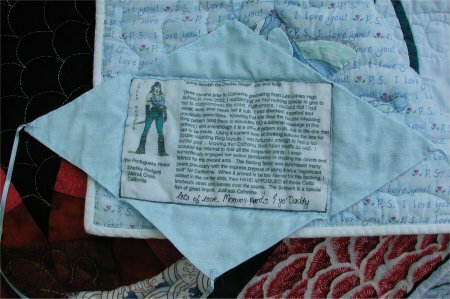 I wanted very much to be able to tell Catherine that I had done the entire quilt myself, including the quilting. Any one who has wrestled a large quilt through the throat space of a home sewing machine can appreciate the extreme frustration and annoyance I experienced. To my regret, I will admit to uttering some very unladylike words when the quilt and the sewing machine didn't want to play nicely with each other. When I was finally done, I swore I would never, never, ever do such a large quilt like that again. I needed a LARGE container to put the quilt in for her graduation party. The only thing vaguely big enough was a Rubbermade tote. So, that was the "gift box". And a bed sheet was the "tissue paper". She was a bit confused about the Rubbermade tote and was puzzled when I told her that she couldn't keep it OR the bed sheet. It wasn't until she unwrapped it, that she finally realized that the quilt she had been admiring all those months was really hers! I still needed to do some hand applique work on the back before I could give it to her. By mutual agreement, we decided that she wouldn't bring it to college, since we worried about it being in a public dorm room. (While I had complete faith that Catherine would take good care of the quilt, we had no idea who her roommate would be or who the friends of this roommate might be. 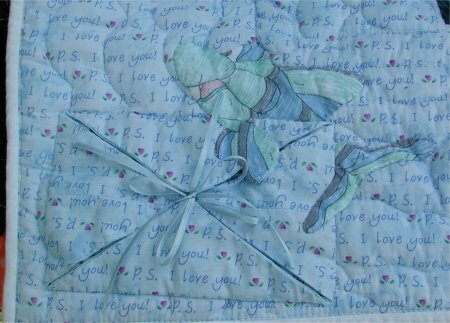 I didn't want to chance some permanent damage to this quilt.) This gave me an additional year to get all the hand work done. 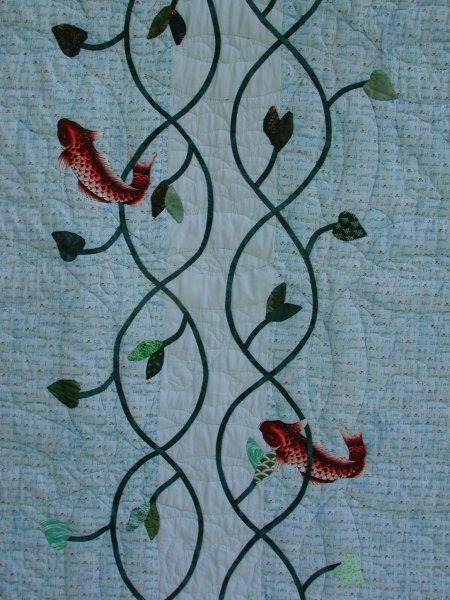 I actually did finish all the vines and leaves that she wanted on the back plus some additional fish from the front of the quilt. Catherine also drew a picture of a stuffed fish that she had (named a Schnark .. for no good reason at all). I drew the Schnark onto fabric, used fabric ink and then appliqued a few Schnarks at the bottom of the quilt. I made a label that could be closed up, so that it "disappears". Catherine actually took possession of the quilt when she moved out of the dorms and into her very first apartment in the summer of 2003. Unbeknownst to her, I also made 2 throw pillows to coordinate with the quilt .. a large pillow (20" square) which used an 18" ring that was left over from the front. I'm not sure why I didn't think about quilting the pillow top, but I didn't. It looks kinda plain, ya know? 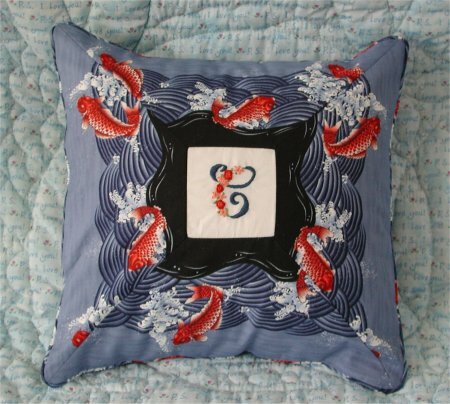 A second, smaller pillow (12" square) was made from one of the coordinating fabrics. 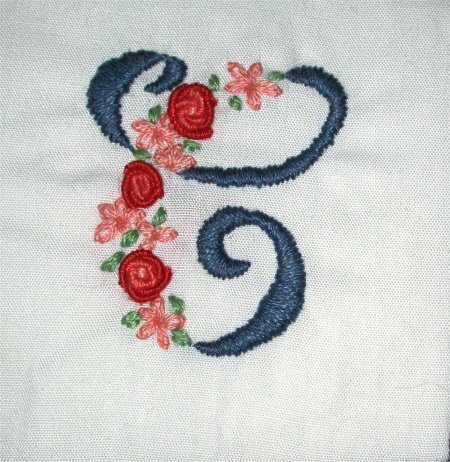 I hand embroidered a script "C" for the center of this pillow.